The latest edition of MTSU Magazine profiles a significant partnership between former Senate Majority Leader Dr. Bill Frist, his wife, Tracy Frist, and MTSU anthropology professor Kevin Smith. A Frist-owned property on the banks of the Harpeth River in Williamson County, Tennessee, points to humanity’s roots as a people: a continuum of culture that spans hundreds of generations and thousands of years. But on one lot in particular — one that’s located where the ruddy waters of Brown Creek spill into the Harpeth River — there is literally more truth to that than an untrained eye could possibly see. Click the cover to view a PDF version of the current issue. And protecting what most of us can’t see — clues that a great civilization that one anthropologist from MTSU knows thrived there long ago — is where the Frists come into this fascinating story. The property contains the remains of a people whose nomadic forbearers arrived in the region some 12,000 years ago. These hunter/gatherers eventually settled down, culminating in a sophisticated civilization that flourished both economically and culturally from roughly 1000 A.D. to 1500. A national program for veterans that finds a perfect fit with MTSU’s student songwriting concentration. An MTSU Department of Criminal Justice Administration faculty member who is a national expert on gangs. Seven female MTSU researchers who are propelling the university to new heights. 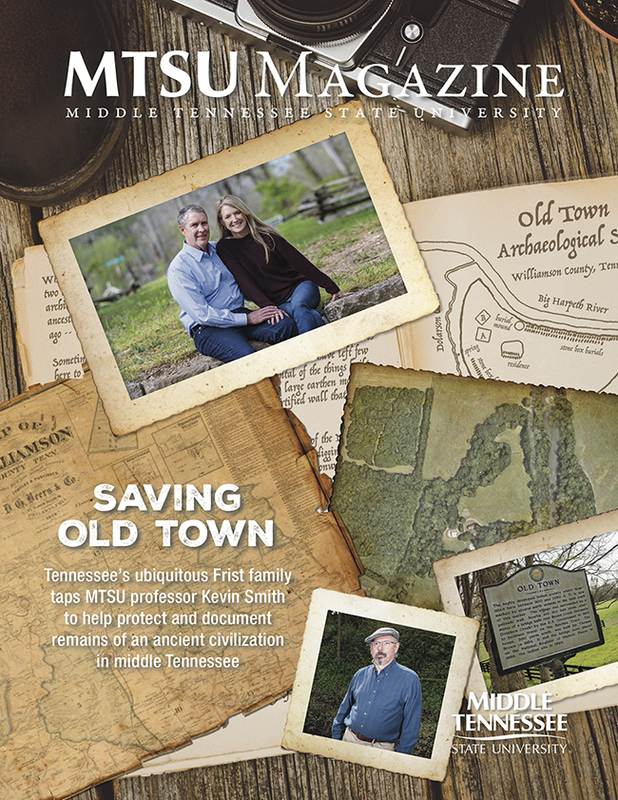 Printed copies of MTSU Magazine are distributed twice annually to more than 120,000 alumni readers. Additional copies of the publication are distributed to interested stakeholders. An electronic PDF version is available here, and archived copies of MTSU Magazine, as well as the university’s other print publications, are also available online at www.mtsunews.com.